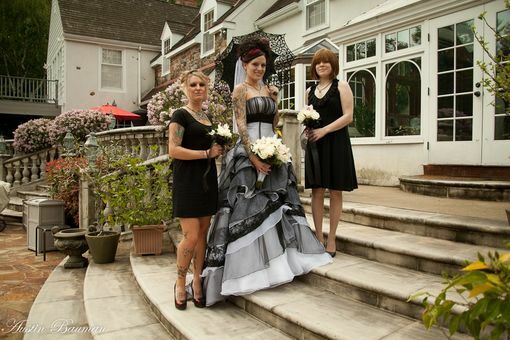 This stunning best selling Gothic Couture Wedding Dress is made with Organza and Point D'Esprit Tulle. The gown is created with a Couture construction in high end fabrics and can be customized for an additional fee. Customization include straps, sleeves, color combinations, length modifications and more. All of my gowns are fully lined, boned, double interfaced and have bust cups. Photos in this listing are from my actual brides. Featured in a premier NJ Magazine. Please note, I do not sell my gowns on Ebay or other similar sites. The original can only be purchased through me.